Understanding and identifying individuals’ capabilities and limitations has always been a challenge within work contexts, but its importance cannot be underestimated. Humans are known for having a limited mental capacity, which means that they can only perform a finite set of tasks at any given period of time. Identifying these limitations is a key factor in the reduction and prevention of what is referred to as Mental Workload (MWL) Overload. Methods have ranged from subjective measures such as Nasa-TLX to quantitative measures individual cognition to utilising a mixture of task performance and physiological measures. Physiological measures are typically task independent and therefore provide a way of objectively quantifying tasks that are typically difficult to do so. These physiological measures, whether directly or not, aim to characterise the participants cognition during the task e.g. Eye-tracking has been correlated to mental workload induced during user studies. My research is focused on using direct measures of workload using non-invasive techniques including the emerging neuroimaging technology – functional Near-Infrared Spectroscopy (fNIRS). fNIRS is a brain imaging technique that offers the potential to provide continuous, detailed insight into human mental workload, enabling an objective means of detecting overload conditions during complex tasks. 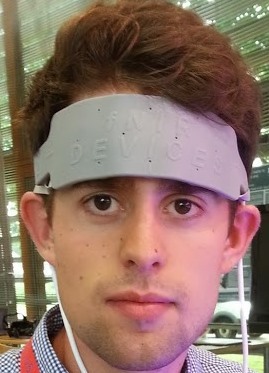 Our fNIRS device (pictured), comes in a headband form factor allowing the easy and direct application to an individuals’ forehead. We note the importance of the simplicity and non intrusiveness to both the researchers in applying the device and individuals wearing the device. fNIRS measures oxygenation levels of the hemoglobin (molecules in the blood responsible for carrying oxygen to the brain and body) within the prefrontal cortex (located directly behind the forehead). The theory goes, that the more effort we dedicate to a task (what we characterise as MWL), the more oxygen our brain needs. While other brain sensing techniques like functional Magnetic Resonance Imaging (fMRI) require minimal or no movement from users, fNIRS can be successfully used while seated naturally at a computer, as well as in car settings and other similar work environments (e.g. train driving, air traffic control). Further, because fNIRS is an optical based technology rather than electrical (such as Electroencephalography (EEG)), it permits more natural movements such as those associated with an individual’s day to day living e.g. using a computer, talking, gesturing, etc, without introducing significant artefacts into the recorded data. We believe that our approach towards this research will allow us to expand upon existing findings with the ultimate aim of being able to detect varying degrees of MWL including overload and underload. The application of such research will allow us to detect and potentially prevent overload situations. Additionally this understanding can potentially be used to influencing the design of future systems to better fit the needs and cognitive requirements of an individual. Maior, H. A. and Pike, M. (2014). Measuring Work Overload. In The Ergonomist magazine of the Institute of Ergonomics and Human Factors (IEHF), No. 527 May 2014. Pike, M., Maior, H. A., Porcheron, M., Sharples, S. and Wilson, M. L. (2014). Measuring the effect of Think Aloud Protocols on Workload using fNIRS. In: CHI’14 ACM SIGCHI Conference on Human Factors in Computer Systems, April-May 2014, Toronto. Maior, H. A., Pike, M., Wilson, M. L., and Sharples, S. CONTINUOUS DETECTION OF WORKLOAD OVERLOAD: AN FNIRS APPROACH. In Contemporary Ergonomics and Human Factors 2014: Proceedings of the international conference on Ergonomics & Human Factors 2014, Southampton, UK, 7-10 April 2014 (p. 450). Maior, H.A., Pike, M., Wilson, L.M. and Sharples, S. (2013) Directly Evaluating the Cognitive Impact of Search User Interfaces: a Two-Pronged Approach with fNIRs EuroHCIR 2013 Workshop, Dublin, Ireland, 1st August 2013.